Since practically the minute Carminia Magaña set foot in Huatulco, Amigos de la Música de Huatulco has been enchanting audiences from across the municipio of Santa María Huatulco with concerts, performances, and art events. An accomplished painter herself, the petite, silver-haired dynamo arrived in Bahias de Huatulco in 1998. Having lived in Mexico, Europe, and the United States, she was looking for the kinds of cultural activities she had always used to fully experience particular places and people wherever she was. 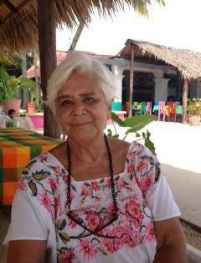 When the municipio was approached, there was little response, so Carminia started building a cultural network of people she met, a writer here, an artist there, always trying to emphasize that these activities were for the entire municipio of Huatulco, not just for the Bahias tourist development. By August of 2007, over two dozen people had formed Amigos de la Música de Huatulco, with the intention of promoting local, national, and international musicians for the enjoyment of residents and visitors to Bahias de Huatulco. Valentina Prudnikov Romeiko was a co-founder of this group; a geography professor at UMAR, Dr. Prudnikov had asked Carminia whether there could be concerts (her cellist husband was retiring and of course he would love to play concerts, and of course he was connected with other Russian musicians). While Carminia was reluctant because of the logistics involved in concerts, Dr. Prudnikov persisted, and the first concert schedule was a cycle of three chamber music concerts, one given by a quartet with cello, two violins, and a pianist, the second by two local guitars and cello and the third by a pianist and cello . (Needless to say, Dr. Prudnikov spent a number of years as a sponsor and organizer.) Scheduled for August, September, and October of 2007, the concerts would be held during the rainy season, and Palapa Chahue, long gone from Playa Chahue, stepped up. Again, they expected about 80 people per concert, and again nearly twice that many showed up. The 2008 series, again in Palapa Chahue, again a cycle of three concerts, was more diversified. Amigos de la Música de Huatulco, now an official organization, presented an Afro-Latin jazz concert; Mexican singer Viola Trigo, accompanied by flamenco guitar; and a chamber music concert featuring works on a Spring theme by Vivaldi, Mozart, and Tchaikovsky. Even though more people bought tickets, and more people became sponsors, concert fees were going up and it was becoming difficult to raise adequate funding. The local audience attendance decreased, for various reasons, although locals did continue their sponsorship. The venue became a problem as management changed and Palapa Chahue was no longer available. With a little help from her friends, though, Carminia re-steered Amigos onto the path to success. Yvonne Kraak, at that time the Regional Director for Camino Real Zaashila and Quinta Real Huatulco, suggested that use of its seaside venue would be a great community contribution for the luxury hotel—Amigos concerts are still held there, five years later. The 2009 season kicked off by the beach at Camino Real with El Quinto Sol, a brass quintet with a stunningly diverse repertoire that ran from the Baroque to the Beatles. The following day, El Quinto Sol gave the first of Carminia’s community educational concerts. After starting in schools in La Crucecita, Carminia worked with the municipal department for education and culture to garner the support to extend the concerts to schools across the municipio. While not all musicians are able to stay, or are willing to provide a community concert as a bonus, there have been over two dozen such concerts to date, the most recent in La Jabalina, a town off Route 200 above Tangolunda in Huatulco. By the 2010 season, with a beautiful venue secured through a stable relationship with Camino Real, Amigos de la Música de Huatulco was firmly established as a one of Huatulco’s major cultural assets. The organization reached a key milestone in 2011, when they needed a music director. Only one name came up—Horacio Franco. A virtuoso on the flute and recorder (he favors the recorder in all sizes), Franco built a stellar international career after his studies at the National Conservatory in Mexico City and the Sweelinck Conservatory in Amsterdam. He had already played several concerts for Amigos de Música, and gave one of the first community educational concerts back in 2009. Although Carminia regrets that the local audience has diminished (80% of attendees are now ex-pats), and needs to do some rebuilding of sponsorships and ticket sales after taking a two-year leave, there is no question that Amigos de la Música de Huatulco is on a strong footing. She sees her job now as increasing sponsorship and bringing in new people to whom she can delegate managing the various functions on the organizing committee. Sponsorship remains at $1,000 pesos—a true bargain in the cultural world. To become a sponsor, sign up at one of the concerts or email Carminia directly: carminiamagana@gmail.com.